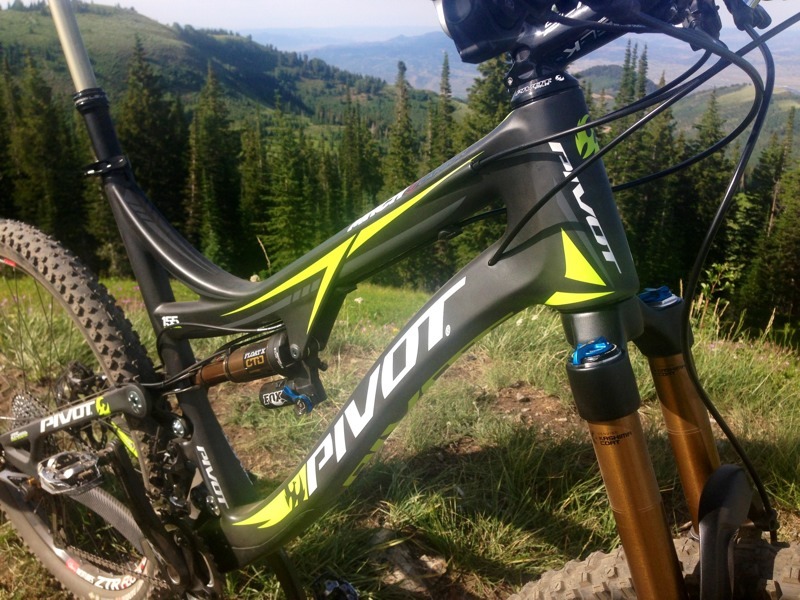 The all-new Pivot Mach 6 mountain bike has been in development for two years, and founder Chris Cocalis says it’s designed to be the ultimate enduro race bike. 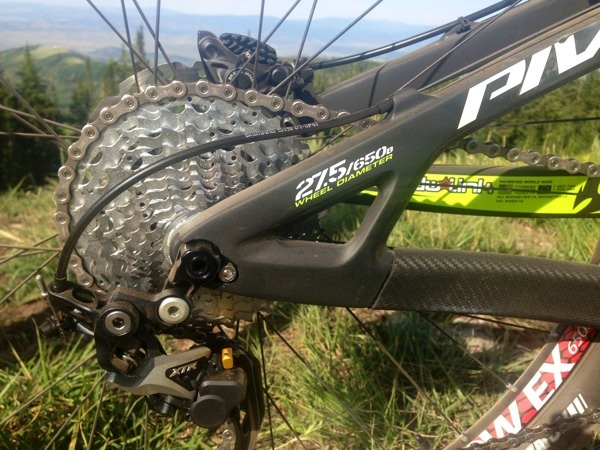 It’s built around the DW Link suspension design like the rest of Pivot’s line, but gets an entirely new rocker arm and bearing design to help keep the chainstays extremely short despite the 155mm (6.1″) travel and improve small bump performance. It combines that with a very slack 66° head angle and long top tube to provide a very stable ride, particularly when things point downward and get fast. Fortunately, it’s also perfectly quick on tight, flat sections, too…something we verified with a couple hours of riding on it. The frame is full carbon, built using Pivot’s hollow box high compression internal molding process to keep things light, strong and stiff. And it is indeed stiff. The Mach 6 has Pivot’s instantly recognizable look. 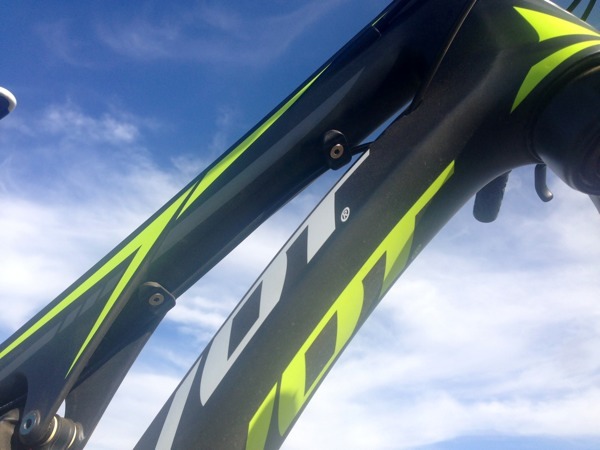 The top tube length ends up about a centimeter or slightly more than the Mach 5.75. The reason is to allow for the increased travel without putting an odd bend in the downtube. It also keeps the overall cockpit in the right range given the trend toward shorter stems. The tapered headtube is nicely shaped and has internal ports for stealth dropper routing that hides the cable from here on back. Shift cables also go internal, but pop out just above the shock (bottom of the top tube). 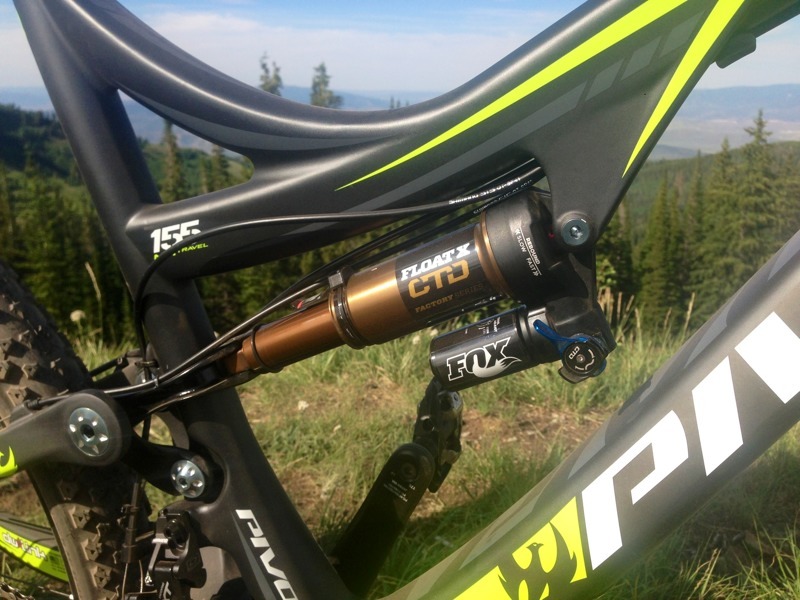 The geometry is based around a Fox 34 150mm fork, but can easily handle a 160mm fork. The change in the already slack head angle from the additional length will generally be mitigated by increased sag, but still provide a bit plusher ride for big days. The brake hose runs externally through multi-cable guides, so you can also run a non-stealth dropper post and still keep the cables under control. Moving down, there’s a rubberized leather protective plate over the downtube and bottom bracket shell to keep rocks and such from chipping or cracking the frame. Similar protection is on the chainstay and inner seatstay. ISCG05 tabs sit behind the chainrings, and the front derailleur is direct mount. There will be an XX1 equipped model, too. The bottom bracket height is 13.6″, which is intentionally low. Cocalis says aggressive, experienced riders will really appreciate the lower center of gravity, and that the occasional pedal strike from less experienced racers is a compromise he’s OK with. Up top, it uses a very long stroke shock, which allows for lower pressure and more supple performance. 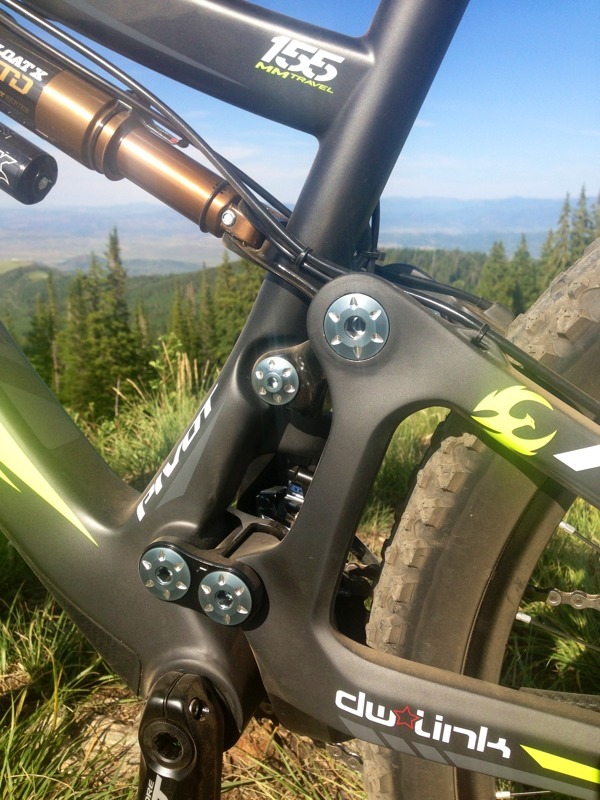 The mounts are universal, so you could swap in any major brand, including the Cane Creek Double Barrel. The included Fox Float X is custom tuned with an increased adjustment range from the CTD settings. The “next generation DW-Link” suspension uses a new rocker link that has two upper bearing positions. 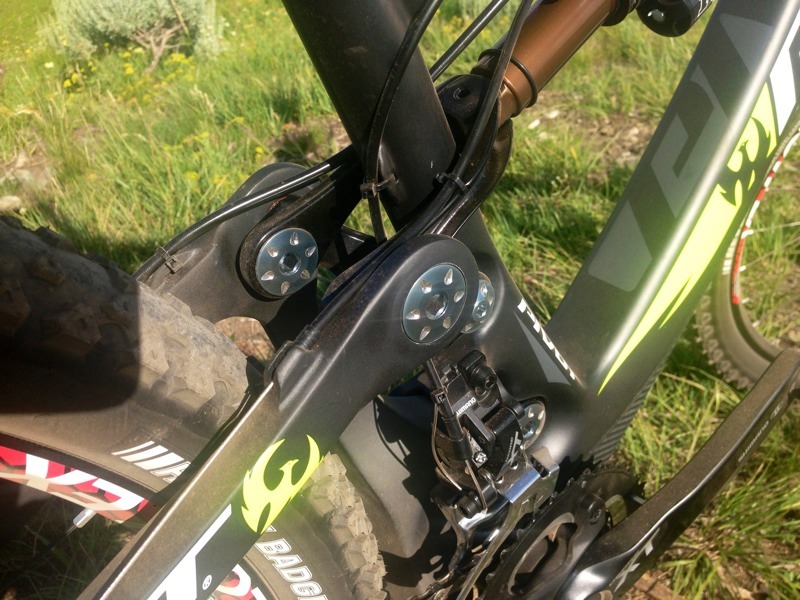 This connects the shock yoke and rear triangle at slightly offset positions, which let them fine tune the variable shock rate to maximize performance throughout the travel range. Cocalis says they played with an eccentric pivot design, but this proved lighter and smoother while also allowing for shorter chainstays. They come in at just 430mm (16.93″). But the design wasn’t just driven by geometry preferences. Cocalis wanted something that really highlighted the DW-Link’s anti-squat characteristics. He says it climbs just as we’ll as it rips the downhills. One last benefit to the design is that it replaces the bushings of the other bikes with dual-row Enduro Max cartridge bearings. 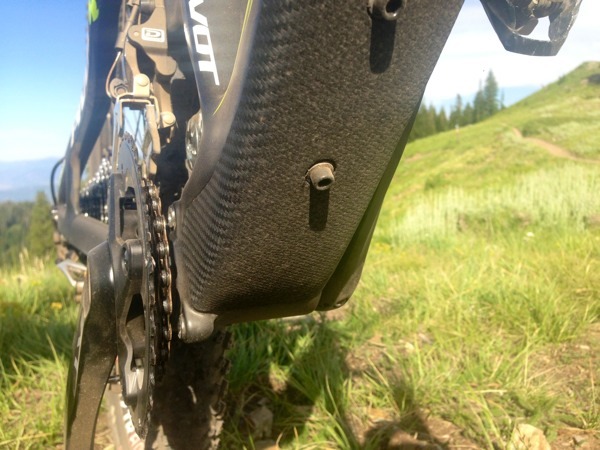 This also aids small bump compliance, which improves traction. Bringing it all together is a 12×142 rear axle, post mount rear brake tabs and a PFBB92 bottom bracket.